4-20mA Current loop output is a type of electrical signal that is used in a series circuit to provide a robust measurement signal. The sensor or instrument generating the signal acts like a current source providing a constant current output signal for a given measurement independent of supply voltage or circuit impedance. Unlike voltage outputs, the current output is the same at any particular point in the circuit and is a relatively high power analogue output which can be used in measurement circuits over long distances. A typical current output is 4 to 20 mA in a 2 wire configuration, but there are 3 wire configurations which can provide 0 to 20mA or 4 to 20mA current loop output signal with a separate positive supply and output connection. The current can be converted to voltage output for measurement purposes at any point in the circuit by adding a load resistor in series. The voltage drop across the resistor will then vary proportionally with pressure and current. For example a 250 ohm resistor will produce a 1 to 5 volt output signal with 4-20mA current loop signal. 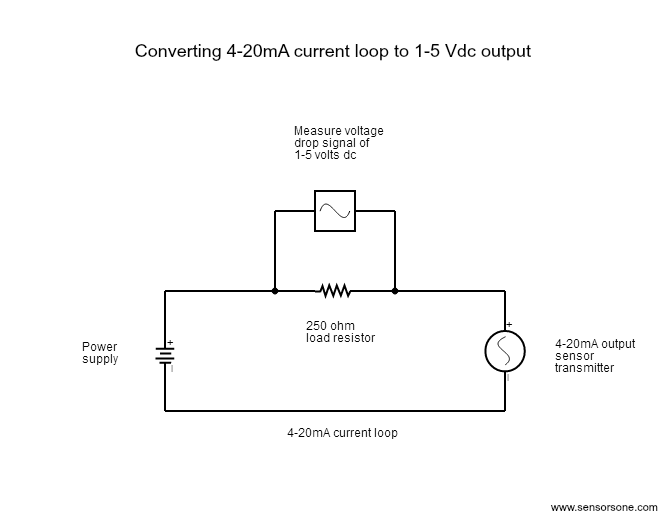 When connecting up a 4-20mA transmitter to a circuit with a measurement load resistor it is important to ensure that there is sufficient supply voltage available across the transmitter positive and negative supply contacts particularly at full scale output. 4-20 milliamps is used extensively throughout the process control industry and is also being increasingly used for manufacturing, aerospace and automotive applications because of the convenience of 2 wire connections, robustness to RFI, and similar size to other types of output devices . If a 4-20mA signal is connected to a DCS circuit that accepts a 1-5 Vdc input, which of these statements are correct? Either statements can be true because it depends on which part of the circuit you are referring to. Statement 1 would be true if you were relating the connection of the resistor to the 1-5Vdc signal input – Connect 250 Ohms resistor in parallel with the 1-5Vdc input wires. Statement 2 would be true if you were relating the connection of the resistor to the current loop circuit – Connect 250 Ohms resistor in series with the 4-20mA current loop circuit. 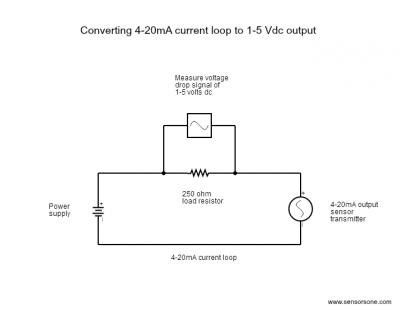 If you were to ask what is the most usual way of describing how a 4-20mA current loop signal is converted to a 1-5Vdc output signal, then statement 2 would be the one that most people use. 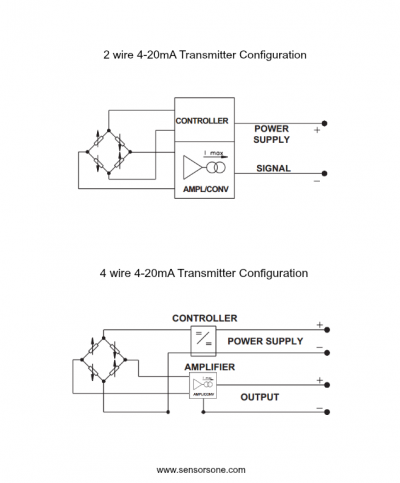 What is difference between a two wire and a four wire 4 to 20 milliamp transmitter? Two wire 4-20mA transmitter will have a single loop circuit with the transmitter [+/-], power supply [+/-] and signal conditioning unit (SCU) [+/-] all connected together in series. Four wire 4-20mA transmitter will have a separate output and supply circuit. The transmitter output +/- will be connected to the SCU +/-. The transmitter supply +/- will be connected to the power supply +/-. I have a pressure transmitter with an output of 4-20mA / 2 wire. How could I change this current output to a voltage output? Add a load resistor in series with the current loop and then measure the voltage drop across the load resistor. For example a 250 ohm resistor will convert a 4-20mA signal to 1 to 5 Vdc. Also note that you will need to allow for the required additional power supply of 5 volts over the sensor’s minimum supply voltage of 9 Vdc, to allow for the extra load resistance. Why do current loop transmitters provide a signal which starts from 4ma and not below this? 4-20mA is normally a 2 wire current loop and in order for the device to operate it needs to consume some of the current to function, and this is provided by the minimum current of 4mA. Also it is useful to know whether the current output device is functioning, unlike a 0-10Vdc signal for example, a zero mA signal would suggest there is a failure in the current loop circuit at some point. Why do current loop transmitters provide a signal which starts from 4ma and not 0mA? The main reason is that 4-20mA is normally a 2 wire current loop and in order for the device to operate it needs to consume some of the current to function, and this is provided by the minimum current of 4mA. 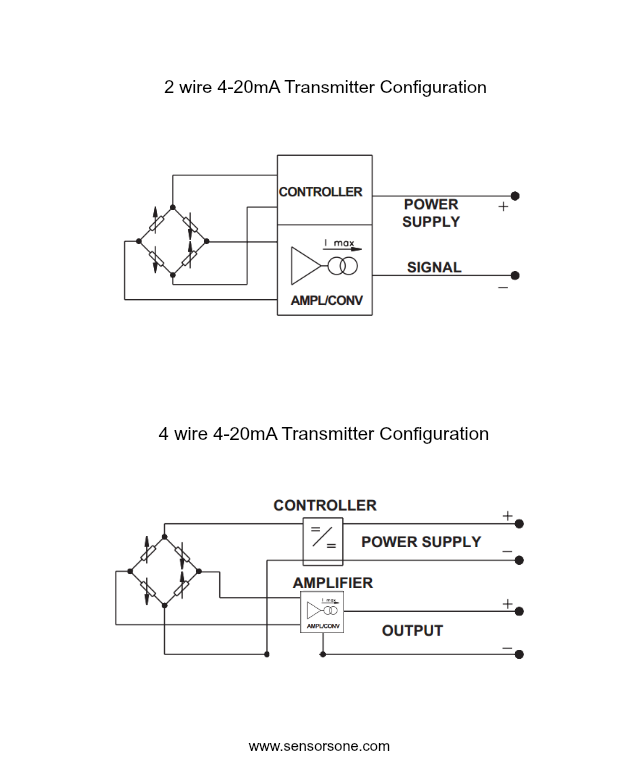 Send us your enquiry for a product associated with this 4 to 20 mA Current Loop Output Signal page, and get assistance with selecting a product for your application.